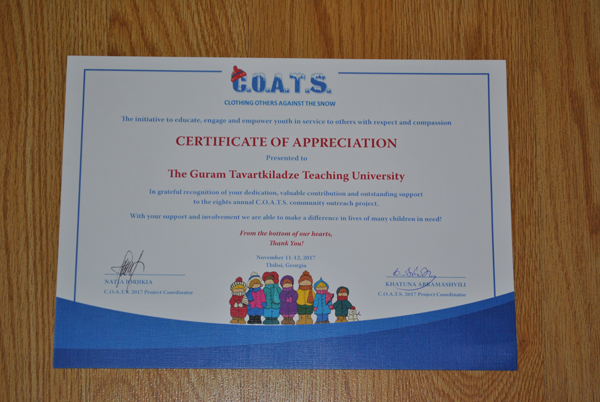 Guram Tavartkiladze Tbilisi Teaching University is a participant of many charitable and humanitarian events. Project COATS (Clothing Others Against the Snow) has been helping with winter clothes for 9 years, homeless children and orphans. GTUNI is a loyal supporter and active participant of this project. Last year university students demonstrated special care to the children and carried out many supportive activities within the project. Accordingly, the coordinators of the project were awarded with the certificate of appreciation. Students of Guram Tavartkiladze Tbilisi Teaching University will take active part in the ninth charity event and will afford the warmth and care for the children who need it.